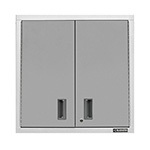 This Gladiator garage cabinet system spans 8.5 feet and will get you organized in no-time. 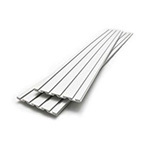 These cabinets are fully-welded with minimal assembly required. 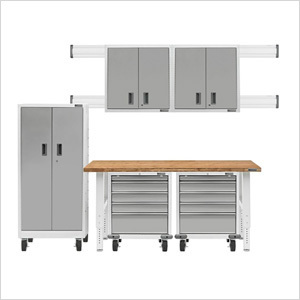 The unique white frame and smooth silver door finish sets this system apart from other garage organization solutions for a high-end and clean look. All cabinets are fully lockable and feature a hassle-free, lifetime limited warranty.